This is a lovely bean salad recipe, or more properly, a bean and legume salad. It is a combination of mixed legumes and green beans in a tasty vinaigrette dressing. The recipe comes from a cookbook called The Best 30-Minute Vegetarian Recipes by Marie-Claude Morin. 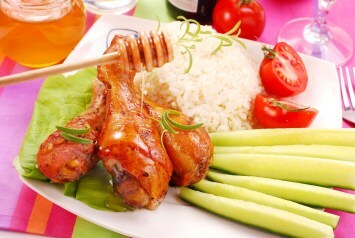 You can serve it as a side salad with either a vegetarian or meat meal. In a salad bowl, combine mixed beans, tomato, green onions, bell pepper and zucchini. In a steamer basket set in a pot of boiling water, steam green beans for about 5 minutes or until tender-crisp. For the Dressing: In a small bowl, combine vinegar, oil, mustard, herbes de Provence, and salt and black pepper to taste. Pour over vegetables. Wait at least 15 minutes for flavors to blend before serving. Herbes de Provence is a dried herb mixture from southern France. It most often includes thyme, savory, rosemary, marjoram, sage, lavender, bay leaves and basil, as well as fennel seeds. There are many commercial varieties available. This healthy cookbook is filled with over 150 recipes, all healthy vegetarian recipes that are ready in under 30 minutes. This bean salad is so versatile. It can also easily become a complete vegetarian meal when it’s served with fresh bread and cheese. You can also use this mixture to fill tortillas. Now that would be tasty. Use whole wheat tortillas to maximize the nutritional value. 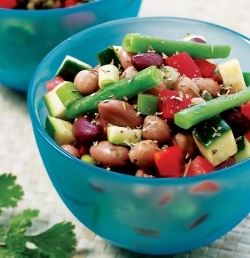 This healthy bean salad recipe is just one of our healthy salad recipes. Find them all here.